Cocktails With Whales is a fun, unique experience at the Mystic Aquarium! I am not ashamed to admit that I LOVE the aquarium. One of my favorites is the Mystic Aquarium in Mystic, Connecticut. I like the layout and I LOVE, LOVE, LOVE that they have beluga whales. They are such beautiful creatures and Juno, the younger of the 2, has quite the personality. He poses for selfies, photobombs, and starts trouble with the patrons. 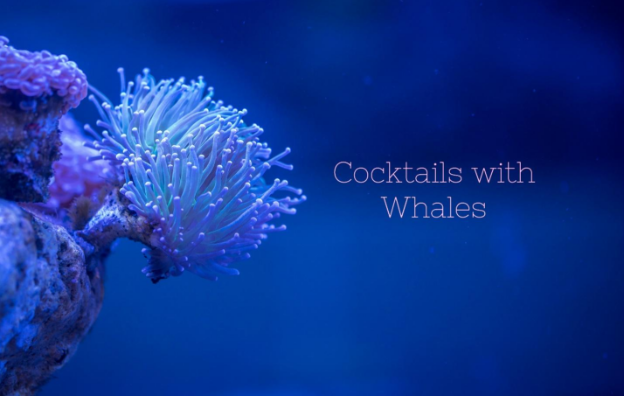 I recently went to an adults only evening that they have periodically called “Cocktails with Whales” and it is every bit as amazing as it sounds. First of all, it’s only $10. That gets you in the door to socialize with your friends, coworkers, strangers, and the whales. There is a cash bar and prices are average priced. I nursed my $8 drink the whole 2 hours we were there. People, as a whole were friendly and courteous. 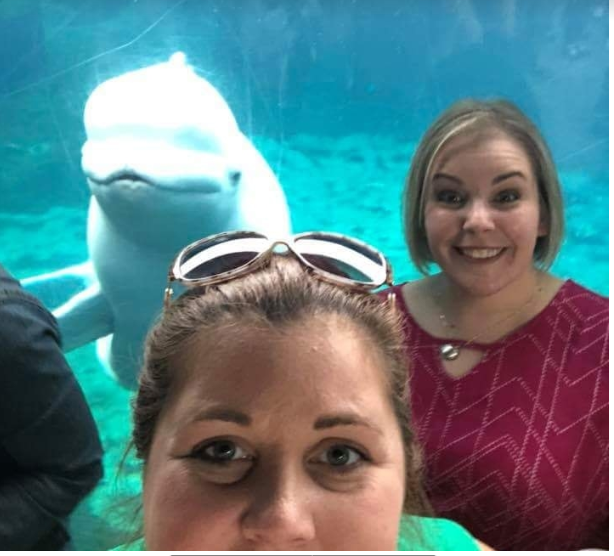 Of course everyone wants to be near the tank and get their selfie with the whales but most were pretty considerate of others and moved along after a few minutes so others could have their chance. Juno did not disappoint. He entertained everyone for 2 full hours. Coming up behind people and smiling, splashing us, and at one point, looking like he wanted to fight one woman. In talking with one of the employees, I learned that Juno loves attention and has quite the personality, He is 16 and is very much “a punk teenager”. The other beluga, whose name escapes me, was content to swim quietly in her area of the tank and let Juno revel in the spotlight. All in all, it was a fun night out without kids…which we all need sometimes. I would highly recommend it, and for $10 you really can’t go wrong. I got some great pictures of Juno and a pretty funny video of him as well. As always, check out more of my adventures on https://www.facebook.com/Adventuregirls0608/ and https://www.instagram.com/adventuregirls0608/. Oh my goodness. He’s quite the “ham” isn’t he! I would love to meet him. I truly believe we have only scratched the surface on how intelligent these beautiful animals are. That looks like it was a ton of fun. What a cute guy he is. I’ll bet he’s the life of the party! That is so perfect for me! I love aquariums, too, and Beluga whales are my absolute favorite. They are such charmers. This would be tons of fun. I love aquariums too–in fact, my post today is about one as well! I would enjoy a cocktail with the whales. Juno is too cute. I would love to do something like this with my kiddos. We don’t live close enough to this place to do this but I do have other aquariums close to me I need to check and see if they have something like this. It looks like it was a lot of fun. I also love aquariums and zoos and always love the opportunity to go with or without kids. Those whales are so cute and I would like to meet him and go to that aquarium. This is such a cool way to spend time with friends. I’d be so excited to see those beautiful animals up close. This sounds like such an interesting night out to take with friends and family. I mean how close did you get to such amazing creatures just WOW! I have always been obsessed with aquariums! Whenever we travel, I make a point of visiting local aquariums. LOVE the photos and you’re right, $10!? That’s just awesome! Cocktails with whales sounds so much fun! This reminds me of the excursion we did in Southern Philippines, we swam with whalesharks. I love Mystic CT Aquarium too! I have not made a trip there in a while and so need to! What a cool aquarium. I love getting to see fun sites like this sans kids! I visited the Mystic Aquarium a few years ago and I agree that it is so awesome! We spent half a day but it was not enough time at all. I hope to go back to visit one day soon. There is no shame in loving aquariums. I think they are so interesting and Juno sounds like such a great entertainer. You also can’t beat the price for $10 I would enjoy that! Adults-only night at the aquarium sounds so fun! And $10 is amazing—last aquarium we went to was $50!!! Insane! I love adults only nights at attractions – fun idea for a date! Juno sure does ham it up for the camera doesn’t he. lol This sounds like such a fun evening. Looks like fun for sure! We love the aquarium. And of course, love those occasional nights out without the kids. That looks like a fun place to visit! I would love to work from an aquarium for a day and watch them swim while I sit on my laptop. It sounds like a very fun evening! Particularly the selfies with whales. Not something you’d get to do every day. Thanks for sharing! Everyone raves about this epic aquarium in Mystic and this sounds like a really fun experience for the whole family. Bucket list! Omg this would be so fun!!!! I’ve always wanted to see whales up close like this. Aw Juno is so cute! I used to love going to the aquarium as a kid. My favourites were always the sea otters. I’m all up for aquariums especially those where you can see the animals up close, like really close. I always find String Rays so weird that they look like a ghost when plastered against the glass. This looks like such a fun experience! We love visiting the aquarium too and would have so much fun here! Oh my god that’s awesome. I’d love to have cocktails while watching that cutie! This looks like so much fun! I would love to do this with my husband someday! That would be a lot of fun to attend! It’s an event I’d go to.